Compound interest is the foundation of investing. It’s even more important, the whole financial system in our world is based on compound interest. It’s everywhere, and this is why it’s so important to understand exactly what compounding is. Here I will talk about the most commonly used compounding interest formulas in our everyday life and this way I will show you how the 8th miracle of the world works. 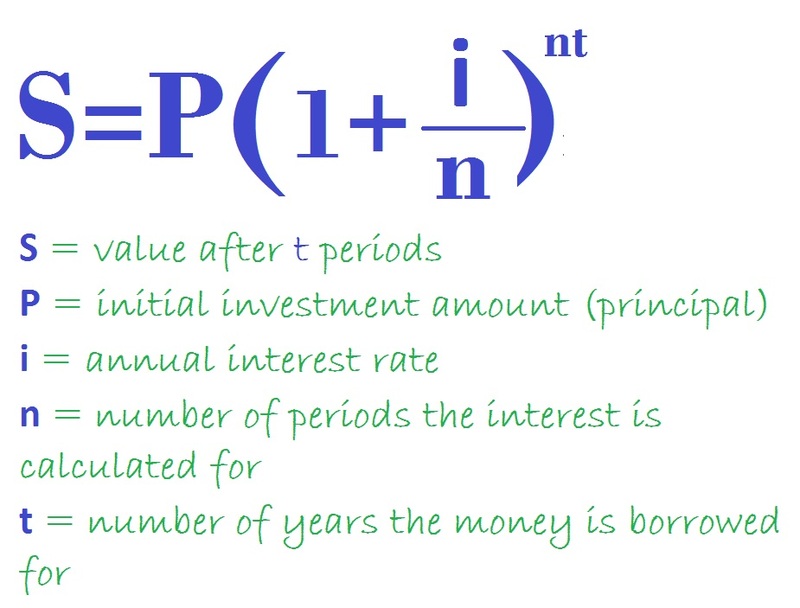 This is the formula of compounding interest. 5% x $100 = 0.05 * $100 = $5 profit. You have $105 at the end of year 1. But what about compound interest? It doesn’t come into play in this situation. It’s activated if you decide to leave your profit ($5) in the bank and wait another year. You start the second year with $105 and at its end, you will have again 5% profit. 5% x $105 = 0.05 * $105 = $5.25 profit. You have $105 + $5.25 = $110.25 at the end of year 2. This is where compound interest turns on, compare your profits after each of the two years. The second year you get $0.25 more profit than the first one and this is why you get interest on your interest of $5 from the first year. This is what compound interest actually is. It’s magical because your profit gets bigger and bigger every next year without the need to add anything to your initial investment. In compounding, the interest after each year is capitalized, becomes an addition to the initial investment and starts earning interest itself. If we continue the example, if you leave your investment in the bank one more year (third), your profit will be $110.25 * 5% = $5.5125 and you will have 115.76 in total. It increases again and the best thing is that you do nothing about this, you just wait for another year. After the 4th year, your profit will be $5.79 and so on, and so on. Every next year you profit increases more, and more, and more. 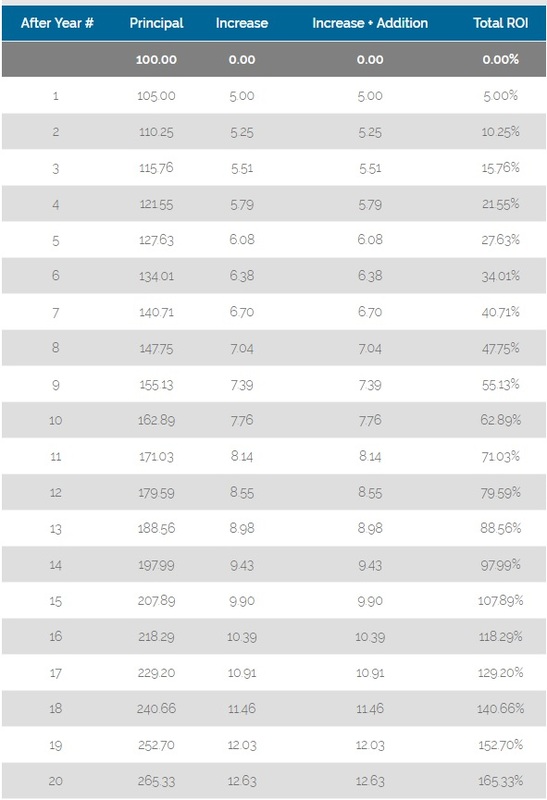 On the following table, you can see how your investment would grow if you waited for 20 years. The results are amazing, after this period of time your initial investment of $100 would become $265.33 and you would have realized 165.33 % total ROI (Return On Investment). This is cool, isn’t it? If you would like to make your own calculations with different percentages and amounts, you can try our nice investment growth calculator. You can use it to plan the growth of your savings and make some more complicated compounding calculations. The growth of $100 invested for 20 years at a 5 percent interest rate. Using again the same example, if you double one more time and make the 10% rate 20%. Your $100 buck would grow to the astonishing amount of $3,833.76 On the table below you can see the three examples together. Just see what you would have after 20 years if you invest just $100, but at 40% interest rate: This is the real power of compounding, I think I explained it well and now you got it. So, the most important thing when you invest is to get the maximum interest rate you can. Even a small difference can make a big impact over time, in the long run. This is also true when you take a loan. Even a half of a percent can change big time the total amount you need to pay for your mortgage loan, just because it is for a long period of time, usually 20-30 years. So, be careful. If you like this post, please, consider sharing it with friends. Also, you can get some investment ideas by visiting our investment strategies section of the site.